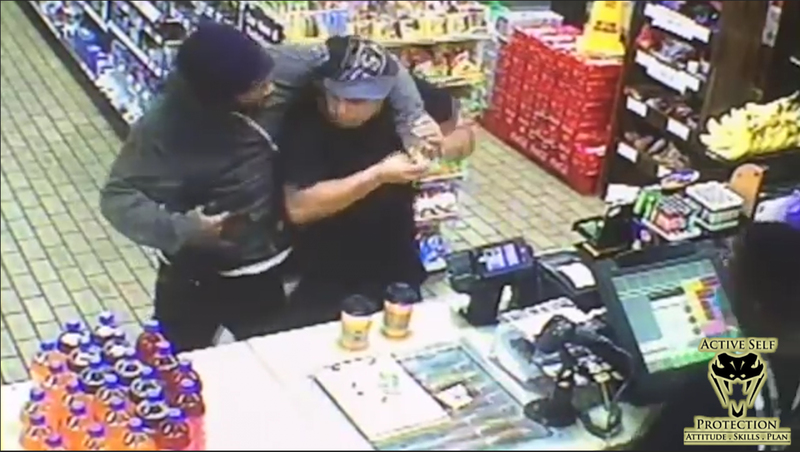 This off-duty officer handled his business against these armed robbers! I think he did a great job practicing Active Self Protection in keeping himself and his wife safe against these armed robbers. They got what they paid for! If you value what we do at ASP, would you consider becoming an ASP Patron Member to support the work it takes to make the narrated videos like this officer overwhelming the armed robbers? https://get-asp.com/patron gives the details. 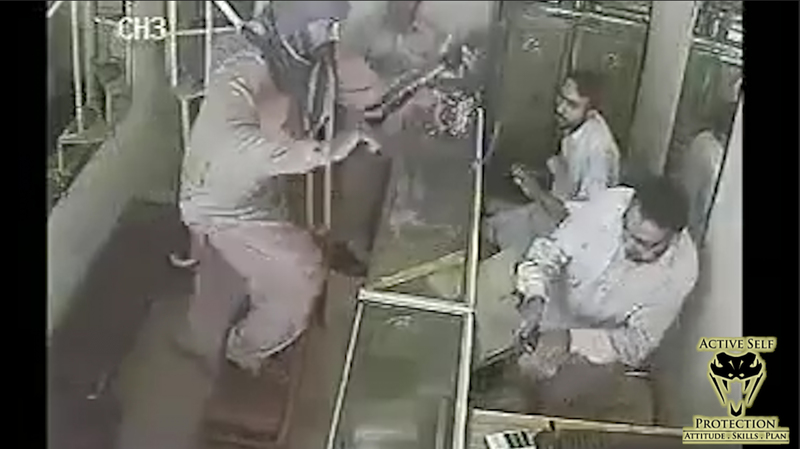 What does this video teach us about the realities of fighting armed robbers? Transitional spaces are places where we MUST be more careful of potential attack. A transitional space is any location that (1) allows attackers to prey on potential victims with an element of surprise and (2) provides ready escape for the attackers. The armed robbers used the choke point of the entryway to trap their victims in an ambush; we all must be aware of the dangers of transitional spaces! In any territorial or predatorial violence, the attacker gets to set the time and circumstances of the attack. They will almost always launch that attack from ambush, or as we like to call it in Umas, from “obscurity.” Surviving that ambush is one of the most important keys to successfully defending yourself. The officer survived the ambush and was able to get ahead of the armed robbers by effectively counter-ambushing! If you have a spouse or significant other who isn’t a self-defender, it’s very important to teach them what their responsibility is if you ever have to use your firearm to defend you both. The same holds true for children or elderly parents or anyone who you are around a lot who doesn’t practice ASP at all. My wife and kids know that if they see my firearm at all they need to get DOWN and, if possible, get away from me because I am about to draw fire. In the car they know to get low. The officer’s spouse did a pretty decent job of staying out of the way and letting her husband deal with the armed robbers! Keep your gun ready to fire. Some people carry their firearm with an empty chamber, but doing so is not recommended for several reasons. First, it assumes that you will have both hands available to you to draw your gun, which isn’t necessarily the case. You might have a hand engaged or injured. Secondly, it assumes that you’ll have time to chamber a round in a gunfight, but gunfights are won and lost on tenths of seconds. Third, it assumes that you’ll have the dexterity to chamber a round under duress, though in the moment many times I have seen people fumble their chambering attempt. Keep your defensive firearm ready to fire, with a round in the chamber! I am very grateful that this officer had his gun ready to fire, because otherwise he might be dead. Capacity matters. My rule of thumb is that I want a minimum of 5 rounds for each bad guy I might face, which accounts for 2 misses and 3 shots on target for each. (of course, you never want to miss…I am just accommodating me on my worst day) When the balloon goes up you will likely pull the trigger more times than you will expect, and no one at the end of a gunfight wishes that they had fewer rounds in their firearm. Here the officer put 8 or 9 shots into the first of the two armed robbers, and he was lucky that the other ran! This is a great example of why, against armed robbers, you MUST have your Active Self Protection ready and your tools accessible! If you value what we do at ASP, would you consider becoming an ASP Patron Member to support the work it takes to make the narrated videos like these employees getting overwhelmed by armed robbers? https://get-asp.com/patron gives the details. In any territorial or predatorial violence, the attacker gets to set the time and circumstances of the attack. They will almost always launch that attack from ambush, or as we like to call it in Umas, from “obscurity.” Surviving that ambush is one of the most important keys to successfully defending yourself. 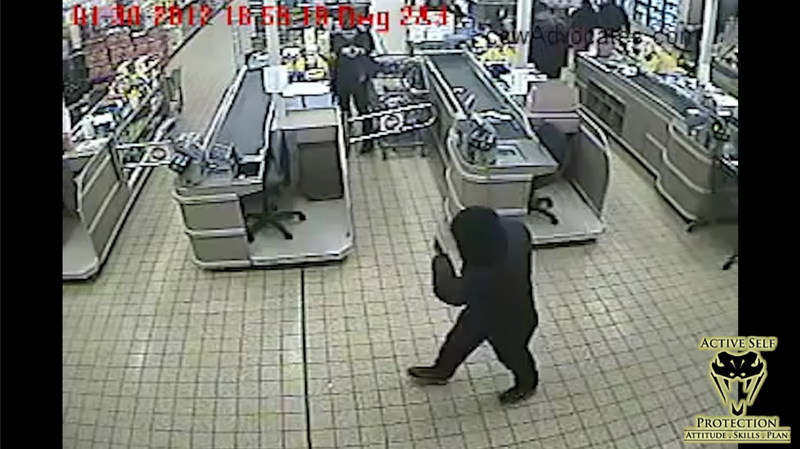 The armed robbers got the drop on these clerks and they had very little chance from there to defend themselves! You must recognize that if you have valuables visible, you make yourself a more inviting target to muggers. Showing valuables like expensive jewelry has social value as well, but the trade-off of that social value is increased attraction of attention from criminals as well. A gold shop is a natural draw for armed robbers, so being prepared to face them is crucial to successfully defending yourself! If you do not have the attitude, skills, and plan to protect yourself from armed robbers, then your only option is to submit to their demands and hope it works out for the best. I would never suggest that a helpless person try to defend themselves against carjacking or armed robbers, though of course if it’s a matter of life and death you must do whatever you can. The point, though, is not to be a helpless victim! This is the heart of Active Self Protection, to motivate you to train and help you develop the attitude, skills, and plan so that you can choose to protect yourself if it makes sense in the moment rather than being forced into compliance with a violent felon. As well-meaning as police officers are, they cannot protect you from armed robbers. As the old adage says, “When seconds count, the police are only minutes away!” You—and ONLY you—can protect yourself from danger when it comes upon you. A police response time of 5 minutes is considered perfectly acceptable in most suburban departments, and times upwards of 30 minutes can be the norm in rural areas! You need to have the attitude, skills, and plan to protect yourself from harm because the police simply can’t. Keep your firearm on your person! Plenty of people keep a firearm stationed near them under the counter or on a desk, but in the moment of need you can’t ever be sure that you can get to it if it’s not on your person. Armed robbers won’t give you all day to get your firearm out from a drawer and into the fight. Keep your firearm ready! In an armed robbery, a cool head is perhaps the best attribute a victim can possess to begin their Active Self Protection. This guy had it, if nothing else! 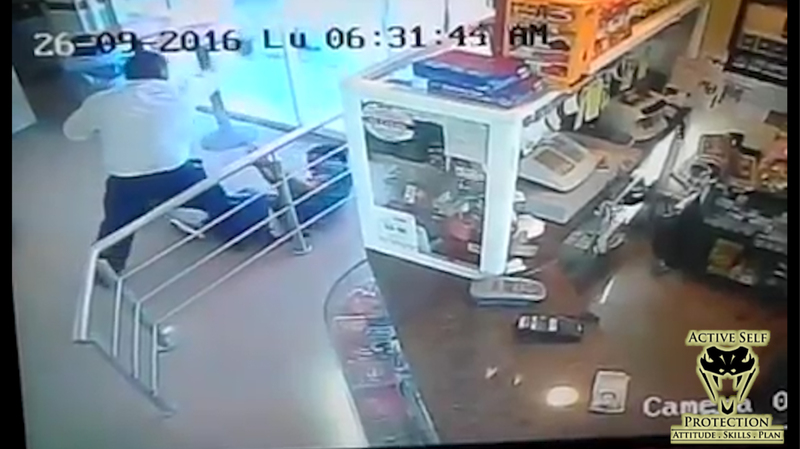 What does this video teach us about the realities of an armed robbery? Situational awareness is your best friend. It doesn’t mean that you always are paranoid or living in “condition orange,” but it does mean that you know Col. Cooper’s color code of awareness and you live by it. Pay attention to your surroundings, and recognize that when you’re in public places you need to be more aware of your surroundings than when you’re in private. Seeing the armed robbery when it was already wrapped around his neck was a bad idea! Transitional spaces are places where we MUST be more careful of potential attack. A transitional space is any location that (1) allows attackers to prey on potential victims with an element of surprise and (2) provides ready escape for the attackers. Convenience stores are such common places for armed robbery that it’s almost impossible to overstate their vulnerability! A life of self-protection must be dedicated to avoidance, de-escalation, and escape whenever possible. You win 100% of the fights that you don’t get in, so make a commitment to de-escalate, escape, or evade any encounter you possibly can. Having good situational awareness will give you more time and opportunity to see problems coming and formulate a plan to stay away and protect yourself without danger to yourself or others. This is always our first choice as self-defenders. This victim should have perhaps tried to escape by whatever means possible from the armed robbery! If you do not have the attitude, skills, and plan to protect yourself from an armed robbery, then your only option is to submit to their demands and hope it works out for the best. I would never suggest that a helpless person try to defend themselves against a carjacking or armed robbery, though of course if it’s a matter of life and death you must do whatever you can. The point, though, is not to be a helpless victim! This is the heart of Active Self Protection, to motivate you to train and help you develop the attitude, skills, and plan so that you can choose to protect yourself if it makes sense in the moment rather than being forced into compliance with a violent felon.! In the moment an armed robber attacks you, you must look for your opportunity to protect yourself. It is strongly possible that the moment of the attack is not that moment. You want to wait for the time that the armed robber is not focusing on you to act with decisiveness to protect yourself in an armed robbery. 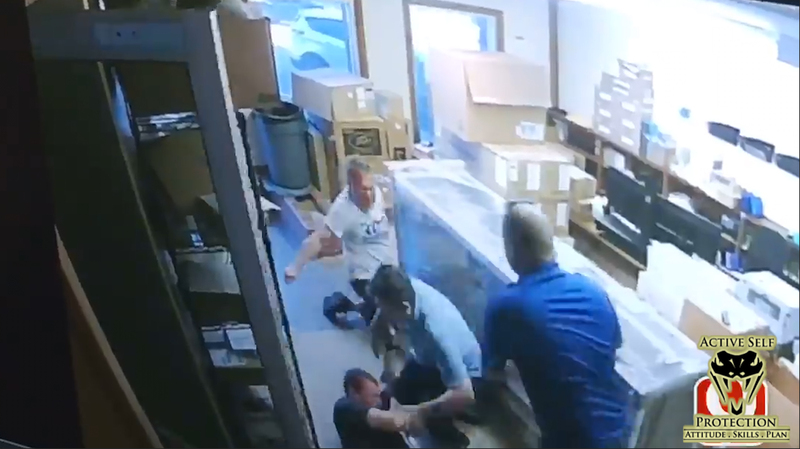 Stopping a knife-wielding lunatic is a team effort, and these employees did a pretty decent job of practicing Active Self Protection in stopping him! If you value what we do at ASP, would you consider becoming an ASP Patron Member to support the work it takes to make the narrated videos like this knife-wielding lunatic? https://get-asp.com/patron gives the details. What do these employees teach us about the realities of fighting a knife-wielding attacker? You must accept that danger exists and that it can happen to you. This is the foundational core of spiritual fitness and the first step in taking proactive steps to protect yourself and your loved ones. If you live in a fantasyland that nothing bad can happen because nothing bad has happened in the past, you’re setting yourself up for a terrible letdown. None of these employees thought they would be in a fight for their lives that day, but the attacker didn’t ask them for their opinion! Sometimes the danger that you must protect yourself and your family from isn’t evil, but is rather deranged. People who aren’t in their right faculties can be a real danger to your family, even if they are not inherently evil. You need the attitude, skills, and plan to protect yourself from evil AND from non-evil threats that pop up! If you read the news story this lunatic had harassed the business earlier and was a known deranged person. That doesn’t make the threat to the employees any less! There is a significant difference between territorial and predatorial violence. (I learned these terms from Marc MacYoung) Territorial violence occurs when an aggressor wants something from you; they put a line in the sand and tell you that you will give it to them, or they will hurt you. Muggings and rapes fall in this category among others. Predatorial violence occurs when the attacker wants you dead and there is no ability to comply with demands to live. In territorial violence compliance might get you out alive, but a predatory attacker will not be stopped short of your death or you having the attitude, skills, and plan to stop them. This deranged lunatic was all about predatorial violence with a knife, and these employees had two choices: get after him, or get cut. This video shows the first-ever defensive gun use by a CCW permit holder in Wisconsin. His gun fight shows us some significant Active Self Protection lessons! If you value what we do at ASP, would you consider becoming an ASP Patron Member to support the work it takes to make the narrated videos like this CCW gun fight? https://get-asp.com/patron gives the details. What does this video teach us about the realities of using a gun in a deadly force encounter for CCW holders? You must accept that danger exists and that it can happen to you. This is the foundational core of spiritual fitness and the first step in taking proactive steps to protect yourself and your loved ones. If you live in a fantasyland that nothing bad can happen because nothing bad has happened in the past, you’re setting yourself up for a terrible letdown. This man got his CCW permit and had his gun on him because he knew that he was his own first responder! Every person gets to decide who they are willing to protect. For some, their “flock” is only themselves and their immediate family. That’s an acceptable answer. For others, they are willing to protect their friends, coworkers, and extended family. For a few, it might mean being willing to protect anyone who is weak, powerless, and in need. Each of us must decide the size of our flock and have that decision firmly in mind when it is time to act. This CCW holder decided that his gun and his skills were for more than him and his wife, and that’s his right to decide. Those who decide to take a safer route and only protect their own family have that right, too! We must each be ready to face the cost of defending ourselves or others, as well as the cost of not defending. If you defend yourself, especially with a firearm, you might well face significant costs financially, socially, spiritually, emotionally, and relationally. You must be ready for those costs! The same holds true of defending others, and you must decide if the costs are worth paying for your family. You can expect to hire an attorney, spend time in jail perhaps, face social pressure from the media or family or your church, etc. That doesn’t mean that you shouldn’t step in, but it does mean that you have to count the cost and accept it. Certainly, to defend your life or the life of a family member, any cost is bearable. But whether you’re willing to pay that cost for a stranger is a matter for personal reflection and consideration. This CCW holder went through a LOT to get his gun back, had court dates, had to hire his own attorney at his own cost, etc. Count the cost of using your gun so that you are ready for it! 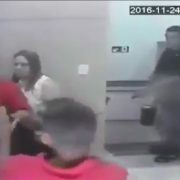 Successful self-defense against many attacks involves a counter-ambush, where the victim finds the right opportunity to seize the initiative from the attacker and launch an ambush of their own. That involves thinking and knowing your own strengths and skill set, and being ready to strike the attacker when your opportunity for counter-ambush comes. It also means not allowing the attacker to see that attack until it’s launched. This CCW holder used a counter-ambush effectively, though it wasn’t as effective as it could have been because his gun malfunctioned. Do not stay in the danger zone if you can possibly help it. So many times people get decision paralysis and freeze, but you cannot stay in a place where a deadly threat exists! Either act to leave the area, or act to protect yourself. Every second you give an attacker is another opportunity they have to do you and yours harm, so don’t allow that. If you can, get out of there immediately. If you can’t, then look for your opportunity to ensure your own safety by whatever means necessary. Before your Kung Fu, and before your Gun Fu, you should consider whether your best defense is Run Fu! The bystanders here all stood around; only the CCW holder took action. If you don’t have a gun (and sometimes, even if you DO have a gun), get out of the danger zone! You must have the attitude, skills, and plan to protect yourself from an armed robber; this off duty cop certainly had good Active Self Protection! Evil exists in our world, and no amount of wishing it away does so. Evil people do evil things, and good people must be ready and willing to stand between them and innocent people and do enough violence to stop them definitively. No amount of negotiation will make truly evil people change their ways; only those willing and able to stop them who use attitude, skills, and plan effectively can. Thankfully these off duty cops were there to stop the armed robber and his accomplice! 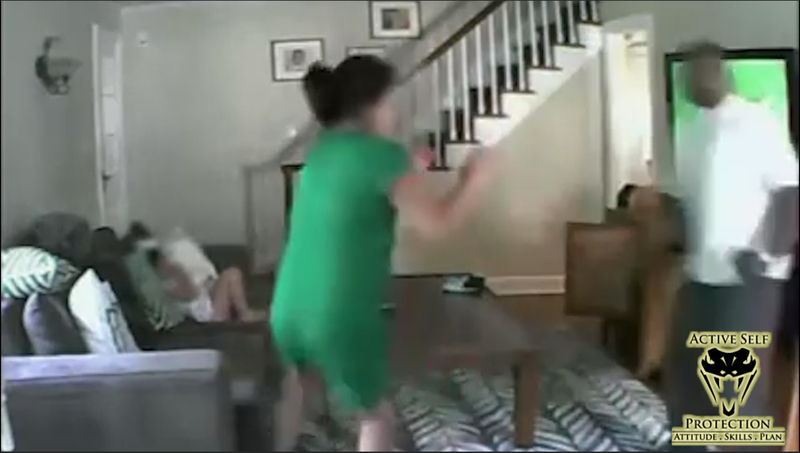 One of the pillars of lawful, moral self-defense is “reasonableness.” (get a nutshell here: http://get-asp.com/wbbp or the whole concept here: http://get-asp.com/1fqe ) In every defensive incident we ask whether the actions of the defender were reasonable from an objective standpoint. Would an objective, reasonable person do what you did in the moment? A good test of whether your actions are reasonable is whether you did them to stop the threat or to punish someone (Charles Humes calls it “The Punisher Test”: https://get-asp.com/nybt it’s a good comparison) It is completely reasonable against an armed robber to defend yourself with deadly force, because they represent a deadly threat. With multiple armed robbers, each one is an armed robber and can be dealt with accordingly, as long as they continue to work in active tandem. Feigning compliance can be an excellent strategy againt an armed robber to buy you time to find your opportunity to defend yourself. The hands-up, palms-out posture tells the armed robber that you’re compliant, and might give you the opportunity to defend yourself when they stop focusing on you. If you have spiritual fitness by knowing what you’re willing to fight for and that you’re willing and ready to win the fight no matter what, you place yourself way ahead of almost any armed robber. Attackers are looking for victims and not looking for fights, so many times when an intended victim puts up a significant fight they will disengage and find other prey. This makes sense even in the animal kingdom where we often see an apex predator disengage from feisty prey for fear of injury. Being ready to defend yourself is a key in self-defense because that defense will often cause the bad guy to run. This is part of why spiritual fitness is so important to self-defense. These armed robbers weren’t shy, that’s for sure. The victims here show us some important reminders for our Active Self Protection as well! You must accept that danger exists and that it can happen to you. This is the foundational core of spiritual fitness and the first step in taking proactive steps to protect yourself and your loved ones from armed robbers. If you live in a fantasyland that nothing bad can happen because nothing bad has happened in the past, you’re setting yourself up for a terrible letdown. The second clerk in the convenience store didn’t have that decision made! We must each decide what is worth protecting. Life is always worth protecting because it is of inestimable worth; as unique bearers of the image of God, people are the most valuable “thing” imaginable. Property is something else, though. With property we always have to balance the benefit against the risk to ourselves and our families. Even where it’s legally allowed, you should consider whether it’s wise or prudent to defend your property, because doing so puts you at risk and not just the bad guy. These armed robbers were a threat to the lives of the people in the store, so it would have been perfectly legitimate to use force to stop them. In the moment armed robbers attack you, you must look for your opportunity to protect yourself. It is strongly possible that the moment of the attack is not that moment. You want to wait for the time that the armed robber is not focusing on you to act with decisiveness to protect yourself. Situational awareness is useful for more than seeing the attack coming, but also for knowing what is happening during the attack. 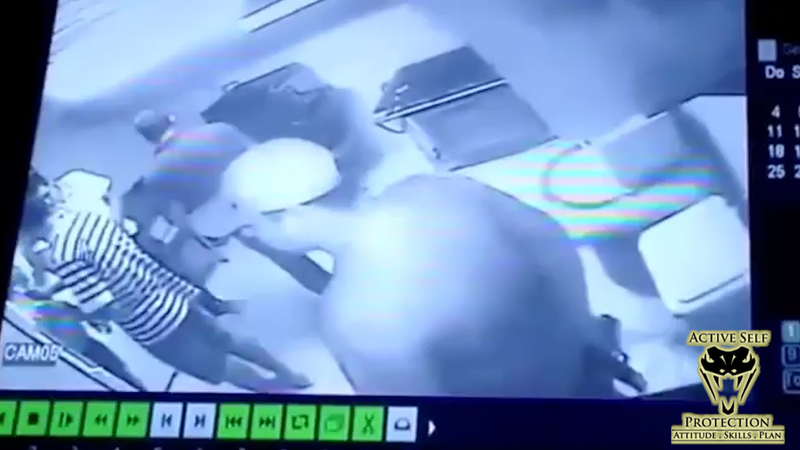 In particular, if your awareness is strong you might get to see the armed robbers put their gun away to use both hands (as happened here), or you might see that the robber’s gun malfunctions or is empty. That information can give you the cue to act definitively to defend yourself by running or by counter-attacking the armed robber. This is not only why awareness is important, but knowledge of firearms and tools is as well! We see this kind of outcome fairly regularly when an armed robber meets an armed clerk whose Active Self Protection is up to the task! Nice work by the clerk to make this armed robber reconsider his life choices. If you value what we do at ASP, would you consider becoming an ASP Patron Member to support the work it takes to make the narrated videos like this armed robber meeting his match? https://get-asp.com/patron gives the details. 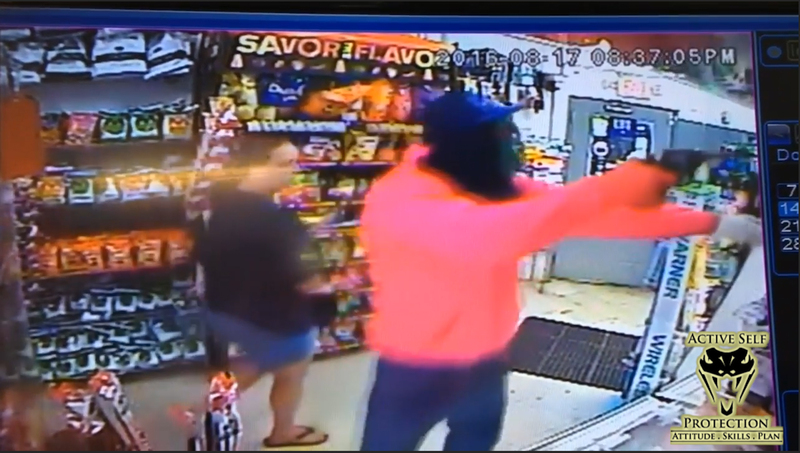 What does this clerk teach us about defending ourselves against an armed robber? Situational awareness is your best friend. It doesn’t mean that you always are paranoid or living in “condition orange,” but it does mean that you know Col. Cooper’s color code of awareness and you live by it. Pay attention to your surroundings, and recognize that when you’re in public places you need to be more aware of your surroundings than when you’re in private. 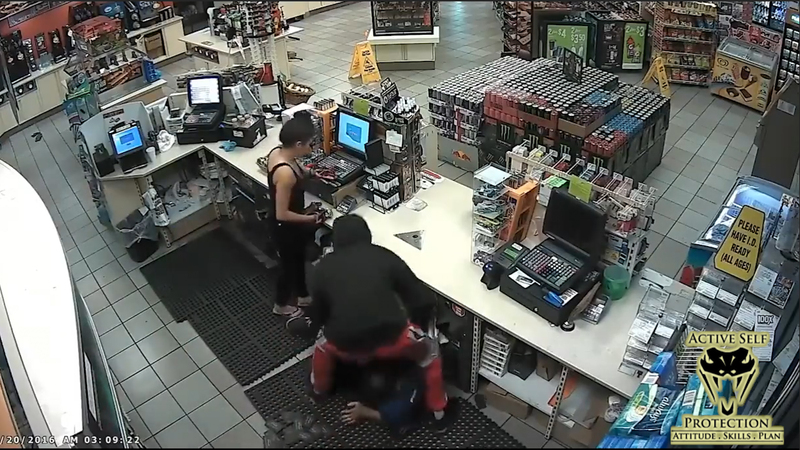 The clerk had to know that these things happen and be ready for an armed robber, and he was! Transitional spaces are places where we MUST be more careful of potential attack. A transitional space is any location that (1) allows attackers to prey on potential victims with an element of surprise and (2) provides ready escape for the attackers. Convenience stores are transitional spaces, and while it’s a rarity for anyone to get into a gunfight in a convenience store, it’s definitely more likely than at the library! In any territorial or predatorial violence, the attacker gets to set the time and circumstances of the attack. They will almost always launch that attack from ambush, or as we like to call it in Umas, from “obscurity.” Surviving that ambush is one of the most important keys to successfully defending yourself. The clerk here was able to bide his time and wait for his opportunity to get to his firearm to deal with the armed robber. In most instances that we see on surveillance video, the first person to put shots on target wins the gunfight. That’s not 100% because injured people can stay in the fight a long time, but it is a good “rule of thumb” because once someone gets shot they usually stop thinking about whatever it is they were doing and start thinking about the pain they’re in and how not to get shot again. The lesson in that is clear: be the first to put shots on target. (this is the corollary to Joe Frick’s Rules for a Gunfight #3, “Only hits count. The only thing worse than a miss is a slow miss.”) Here the clerk put a shot on the armed robber and that took all the starch out of him.